Extreme Action 120% (EX120) Revitalizant rebuilds, repairs and protects worn metal in manual transmissions. It starts by filling in any scratches or worn surfaces in the metal (gears, bearings, distribution blocks, clutches, etc. ), restoring geometry and reversing wear. EX120 then coats the treated surfaces with a layer of ceramic-metal to protect treated metal from future wear. EX120 can be universally applied to manual and robotized transmissions, sequential gear boxes, including Direct Shift type, transfer cases and differentials. The best part about EX120 is one treatment lasts for 62,000 miles! 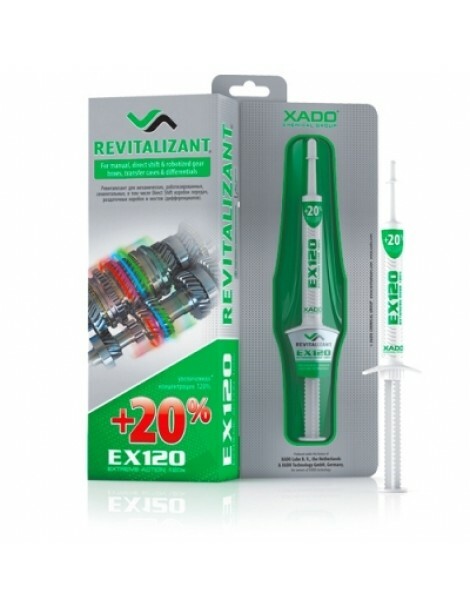 With a 20% greater concentration of active agent, Extreme Action 120% (EX120) Revitalizant is more effective than ever repairing, rebuilding, and protecting worn metal surfaces. 1 Complete Revitalization cycle protects for 62,000 miles. XADO’s Revitalizant technology has been independently tested and proven to work. *Compared to XADO gel-revitalizant for gear boxes, transfer cases and differentials. No matter how well a manual transmission is maintained, high heat and friction causes metal to become worn, scratched, and deformed over time. The destruction of the surface layer occurs in high-friction areas, where entire groups of atoms – clusters - may tear off under extreme loads. Until now there was no way to reverse this inevitable metal wear. EX120 starts repairing scratched and worn metal as soon as it is added to the gearbox. Revitalizant acts as a catalyst for rebuilding and repairing metal in areas of excessive thermal energy. It activates the absorption process of carbon through the surface layer which results in the formation of metal carbides. Revitalizant rebuilds metal at a molecular level, atom-by-atom. A new durable protective coating is formed with the help of carbides and metal particles. Because it has a self-regulating maximum thickness it does not cake. Diffusion of the protective layer into the metal results in an extra durable gradient coating with positive pressing stress forming along the entire treated surface in the final stage of Revitalization. The treated metal is now rebuilt and protected with diamond-like film of ceramic-metal, resulting in smoother operation and longer life.